With Prime Minister Narendra Modi seeking greater investment flow from Japan into India, financial services giant Nippon Life on Monday announced two dedicated funds in partnership with Anil Ambani-led Reliance Group to facilitate Japanese investments into Indian markets. Besides, Nippon Life also reiterated its commitment to a partnership with the Indian business conglomerate for setting up 'Reliance Bank' under an appropriate category of licenses to be issued by the Reserve Bank of India. The announcements -- including for launch of one equity and another bond fund -- coincide with Modi's first official visit to Japan as Prime Minister, during which he invited Japanese investments into India and said that the businessmen from the two countries can give a direction to world economy. Welcoming Modi on his Japan visit, Nippon and Reliance Group said in a joint statement that the two groups would actively expand their collaboration and contribute towards strengthening of Indo-Japan relations. "The Prime Minister's visit to Japan reinforces the strategic focus of global partnership between India and Japan." "As a good role model of business partnership between Indian and Japanese corporations, Reliance Group and NLI Group will actively further expand their collaboration, which will contribute towards strengthening the relations between India and Japan," Reliance Group Managing Director Amitabh Jhunjhunwala said. Nippon Life Insurance (NLI) President Yoshinobu Tsutsui said, "Reliance Capital is planning to set up its own bank which will cater to individual customers and small and medium enterprises all over India. "NLI is also participating in this bank project as part of strategic business alliance with a view to improve the financial infrastructure and contribute towards economic growth of India." Among the two new mutual funds announced for Japanese retail investors, India Equity Selection Fund would allow Japanese investors to "directly invest in Indian companies with long term potential". Besides, the Short Term Indian Bond Fund would allow investors from Japan to directly invest in Indian government securities and corporate bonds. Nippon Life Insurance, a Fortune 100 company and the fifth largest private life insurer in the world with revenue of $65 billion and profit of $5 billion, is the biggest foreign direct investor in Indian asset management and life insurance sector till date. The Japanese insurer has 26 per cent stake each in Reliance Capital Asset Management (RCAM) and Reliance Life Insurance Company (RLIC), both part of Reliance Capital, the financial services arm of Reliance Group. The two new funds would be managed by Nippon with advice from Reliance Capital Asset Management Company (RCAM), which recently launched India's first Japanese Equity Fund to help Indian investors invest in Japan-based global companies. RCAM CEO Sundeep Sikka said that the launch of these funds is "part of our larger initiative to strengthen the partnership between the two corporations and two countries". "These funds will use the collective expertise of our fund managers to help Japanese and Indian investors invest and gain from growth potential in our countries," he added. The equity fund would have a diversified portfolio benchmarked to the BSE 100 index of India's top-100 companies. The bond fund would largely invest in permitted Indian government securities and local currency Indian corporate bonds. The fund also has the capability to invest up to a limit (20 per cent) in offshore foreign currency bonds of large Indian issuers and it can purchase securities with duration of 5 years. Sikka said that Indian markets have grown almost seven times in the last ten years, but the Indian investor still has primary investments in domestic bonds and equities. "Through the Reliance Japan Equity fund, we offer our investors a diversification portfolio in the Japanese market and in global Japanese companies," he said. As part of its strategy to enhance investments outside of Japan, Nippon has already been investing substantially in the Indian equity and bond funds through RCAM. 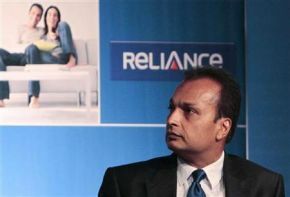 Image: Anil Ambani, chairman of the Reliance Anil Dhirubhai Ambani Group, attends the annual general meeting of Reliance Capital in Mumbai.